In the face-to-face world, facial expressions and body language often speak more than the words coming from someone’s mouth. Your blog’s design communicates in the same way, speaking even before your content does. The colors you use, the fonts you select, the images you showcase, and even the layout you choose all communicate something to the reader. Design should reinforce the personality of your blog or help convey what your blog is about. A powerful image in your header can communicate emotion or a single design element can give readers a clearer picture of your blog’s message. Even text can make a bold statement, serving as a graphical element to attract a reader’s eye. 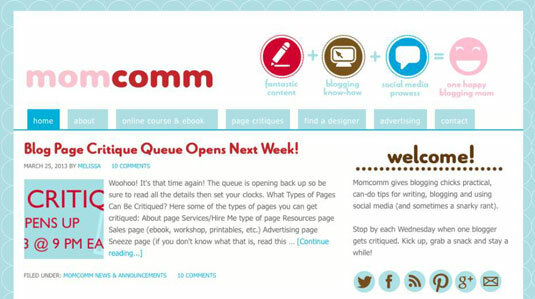 On Momcomm, the author writes about blogging and social media. She wants the blog to be perceived as fun and approachable as well as to communicate that this blog makes even complex topics easy to understand. The blog design features a smiley face in the header and a prominent Welcome! in the sidebar to make readers feel welcome. In addition, the placement of certain blog elements within your design can communicate what you want a reader to do. For example, an e-mail subscription’s prominent location at the top of the page communicates its importance.